Balsamic vinegar is a product of Modena, a province of the Emilia-Romagna region of Italy. True aceto balsamico requires specific sweet grapes produced in Modena which are aged in a succession of barrels made of different woods. The process can take years. For this reason it is very expensive. Most of the balsamic vinegar available today is mass produced using techniques that simulate the aging process. The bottle I got from Trader Joe’s does state on the label that it was barrel aged, but because the price was reasonable, I am assuming that it was not in barrels for any length of time. 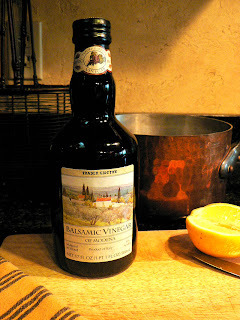 I use balsamic vinegar in salad dressings and sauteed cabbage or sprinkled over cooked greens. I love the sweetness and depth of flavor of this vinegar. It is the most assertive of all vinegars and to really experience it’s goodness try sprinkling it on strawberries for a wonderful sensation in your mouth. 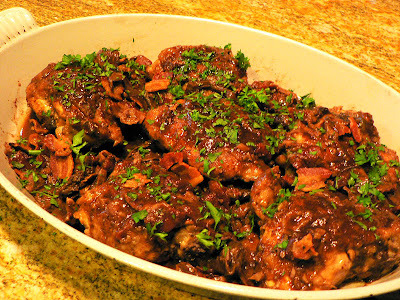 I found this recipe for Balsamic Vinegar Chicken with Wild Mushrooms in an old issue of Gourmet. The article was written by David Rosengarten so I knew the results would be guarenteed. David Rosengarten is one of my favorite people in the food world. He is the author of his own cookbook called Taste and the author of The Dean and DeLuca Cookbook. For a time he had a program called Taste on the Food Network and it was one of the best productions they have ever shown. It was intelligent and insightful and David’s passion and credibility were evident with every episode. I wish the Food Network had not “dumbed down” so much. But that is another story. We had this chicken for dinner last night and it was wonderful. There was so much depth to the flavors that it is hard to describe – woodsy and earthy from the porcini mushrooms, sweet and assertive from the vinegar, mellow from the red wine and down home good from the bacon and sauteed chicken. We are having it again tonight and I have a feeling that it will have improved with it’s rest in the refrigerator. As a matter of fact, it would make a good “do ahead” dish for guests. I served it with plain rice to soak up the juices. In a small bowl let the porcini soak in 1 cup boiling water for 10 minutes, or until they are soft, and drain them well, reserving the liquid. Season the chicken with pepper and dredge it in the flour, shaking off the excess. In a large heavy skillet cook the bacon over moderate heat, stirring, until it is golden and crisp, transfer it with a slotted spoon to paper towels, and let it drain. Add to the skillet the chicken, skin side down, and cook it, turning it occasionally, for 20 minutes, or until it is golden and crisp. Transfer the chicken with a slotted spoon to a plate, season it with salt, and discard the fat in the skillet. Add the oil to the skillet and in it cook the garlic over low heat, stirring for 1 minute. Add the reserved porcini liquid, the wine, the broth, and 3 tablespoons of the vinegar and boil the mixture for 4 minutes. Add the arrowroot mixture in a stream, stirring, stir in the tomatoes, and add the chicken, turning it to coat it with the sauce. Simmer the mixture, covered, for 10 minutes, stir in the porcini and the bacon, and simmer the mixture, covered, for 10 minutes. Stir in the remaining 1 tablespoon vinegar with salt and pepper to taste and sprinkle the mixture with the parsley. Serves 6. Posted on May 15, 2009 at 7:01 pm.